Pearson. Hardcover. 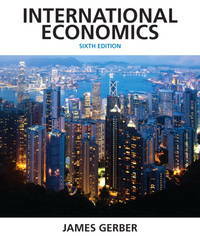 0132948915 New Textbook, Ships with Emailed Tracking from USA . New. Prentice Hall. Hardcover. 0135100151 New US Edition Textbook, Ships with Emailed Tracking from USA . New. 2017-01-21. New. Ships with Tracking Number! INTERNATIONAL WORLDWIDE Shipping available. Buy with confidence, excellent customer service! 2010-01-13. New. Ships with Tracking Number! INTERNATIONAL WORLDWIDE Shipping available. Buy with confidence, excellent customer service! Pearson. Hardcover. 0134472098 New Textbook, Ships with Emailed Tracking from USA . New. Prentice Hall, 2010-01-13. 5. Hardcover. Used:Good. 2017-01-21. Good. Ships with Tracking Number! INTERNATIONAL WORLDWIDE Shipping available. May not contain Access Codes or Supplements. May be ex-library. Shipping & Handling by region. Buy with confidence, excellent customer service! Pearson. Hardcover. 0134472098 BRAND NEW W/FAST SHIPPING! This item is: International Economics, 7th Ed., 2018, by Gerber, James; FORMAT: Hardcover; ISBN: 9780134472096. Choose Expedited for fastest shipping! Our 98%+ rating proves our commitment! We cannot ship to PO Boxes/APO address. To avoid ordering the wrong item, please check your item's ISBN number! . New. Pearson. Hardcover. 0134472098 Like New Condition. . Fine. Pearson. Hardcover. 0134472098 New Condition. . New. Pearson. Hardcover. 0134472098 US Edition Textbook, May Have Highlights, Notes and/or Underlining, BOOK ONLY-NO ACCESS CODE, NO CD, Ships with Emailed Tracking from USA . Good. Addison Wesley, 2007-03-04. 4. Hardcover. Used:Good. 2004-01-08. New. Ships with Tracking Number! INTERNATIONAL WORLDWIDE Shipping available. Buy with confidence, excellent customer service! 2001-08-23. New. Ships with Tracking Number! INTERNATIONAL WORLDWIDE Shipping available. Buy with confidence, excellent customer service! Prentice Hall, 2010-01-13. Hardcover. Like New. Like New Condition! Ships within 24 hours! 2001-08-23. Good. Ships with Tracking Number! INTERNATIONAL WORLDWIDE Shipping available. May not contain Access Codes or Supplements. May be ex-library. Shipping & Handling by region. Buy with confidence, excellent customer service! 1998-10-01. Good. Ships with Tracking Number! INTERNATIONAL WORLDWIDE Shipping available. May not contain Access Codes or Supplements. May be ex-library. Shipping & Handling by region. Buy with confidence, excellent customer service! 2004-01-08. Good. Ships with Tracking Number! INTERNATIONAL WORLDWIDE Shipping available. May not contain Access Codes or Supplements. May be ex-library. Shipping & Handling by region. Buy with confidence, excellent customer service! James Gerber. PAPERBACK. 1292023384 Brand new book. International Edition. Ship from multiple locations. 3-5 business days Express Delivery to USA/UK/Europe/Asia/Worldwide. Tracking number will be provided. Satisfaction guaranteed. . New. NY: Pearson, 2013. 23cm, . hardcover. New/New. PEARSON EDUCATION, 2012. Paperback. Good. Disclaimer:A copy that has been read, but remains in clean condition. All pages are intact, and the cover is intact. The spine may show signs of wear. Pages can include limited notes and highlighting, and the copy can include previous owner inscriptions. At ThriftBooks, our motto is: Read More, Spend Less.Dust jacket quality is not guaranteed. Addison Wesley. Hardcover. 032123796X New Condition *** Right Off the Shelf | Ships within 2 Business Days ~~~ Customer Service Is Our Top Priority! - Thank you for LOOKING :-) . New. Pearson. Hardcover. 0132948915 US Edition Textbook, May Have Highlights, Notes and/or Underlining, BOOK ONLY-NO ACCESS CODE, NO CD, Ships with Emailed Tracking from USA . Good. Prentice Hall. Hardcover. 0135100151 US Edition Textbook, May Have Highlights, Notes and/or Underlining, BOOK ONLY-NO ACCESS CODE, NO CD, Ships with Emailed Tracking from USA . Good. Addison Wesley. Hardcover. 0321415558 New Condition. . New. Prentice Hall. Hardcover. 0135100151 New Condition. . New. Pearson. Hardcover. 0132948915 New Condition. . New. Addison Wesley. Hardcover. 032123796X New Condition. . New. Pearson, 2007. This is an ex-library book and may have the usual library/used-book markings inside.This book has soft covers. In fair condition, suitable as a study copy. Library sticker on front cover. Pearson, 2007. This is an ex-library book and may have the usual library/used-book markings inside.This book has soft covers. In good all round condition.